The static exhibition is a stark reminder of the awful way Britain has treated – and continues to treat – incomers. In a brave move, it rightly does not shy away from racism’s frankly vile messages; difficult to look at and comprehend, but so vital if the experience is not to be sanitised. Today is about lost voices being given the chance to be heard. Poet Ian Duhig tests this with a performance of his poem Machines which he presents stood in front of the museum’s preserved technology. His soothing voice is well matched by the soft rain falling outside. Then the machines start, one by one, until finally they hit a crescendo of clanking and scraping and banging. Duhig does not raise his voice to be heard. Humans need interaction. Many mill workers learned to lip read as conversation was impossible otherwise. We cannot hear Duhig intone ‘Poverty, poverty knock,’ and yet we continue to try. We are like the former workers. We want to be able to hear, but the machinery distracts, competes for our attention. We move to a Victorian classroom where we perch precariously at the wooden desks and benches. The irony of the location is writ large – singer Ahmed Kaysher, harmonium player Amal Podder and percussionist Narayan Dey are framed by reminders of Britain’s colonial past. In this classroom we learn about and hear some incredibly moving Bengali protest songs against a backdrop of a map of the British Empire and a pyramid of world order with God at the top, closely followed by Queen Victoria. The music is mesmerizing. You do not need to understand the language to understand the purpose of the songs. 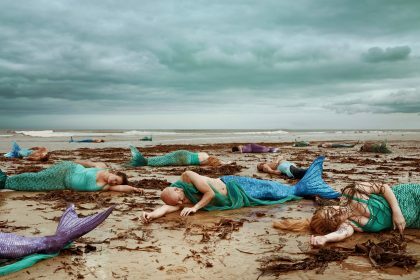 Some are melancholy and mournful, others upbeat and strong, and you know instinctively when to join in. The classroom delivers a sobering lesson. Bengali workers would have had no voice here. In the sewing room, large windows let in plenty of light for the detailed work. 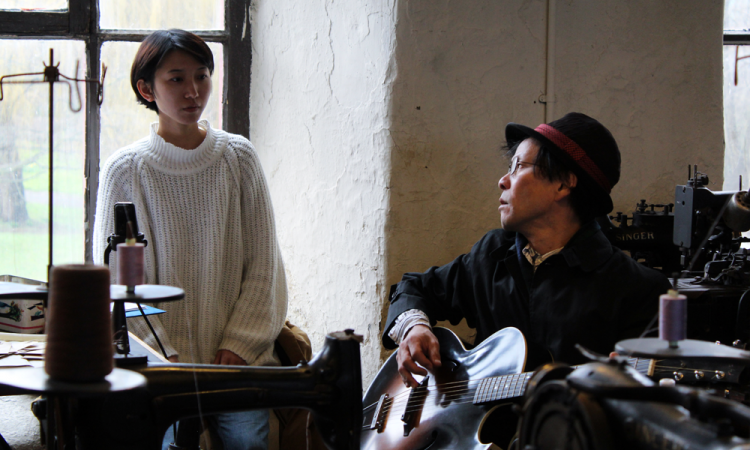 Seated on a windowsill is Minami Saeki whose ethereal set of traditional songs captures the experiences many immigrant workers would have known. Here there is only beauty in the halting, exquisite monosyllabic nature of the songs and pauses, the deep, delicate timbre of her voice, subtly matched by guitarist Taku Sugimoto. Enthralling and elegant as lace, we are held transfixed by these songs. Framed by the pastoral scene behind her – the river, a weeping willow, the lingering storm clouds – Minami is like a trapped bird yearning to be free. Perhaps workers too dreamed of escape from their long, long hours spent here in this room? The final performance leads us into the cold, where Ryoko Akama’s piece is initially ambiguous. She weaves between us. We peer at the various objects assembled and wait to be guided by her. Her performance begins with a high pitched monotone, the soundscape growing in intensity as she carefully positions bottles with hearing aids inside them. We smile appreciatively at this unique and humorous offering, the repeated motif unexpectedly beautiful and calming. Everyday objects linked up to batteries, such as a miniature teacup, begin to gently chime. Immersed in the background rush of the nearby River Aire and the freedom of outside, together it produces a symphony of tiny bells which summon the workers back to the deafening drumroll of the mill machinery. Pavilion’s Interwoven Histories was brought alive by some varied, unique and engaging performances. Each piece was enjoyable and educational, but most importantly it provided a chance for us to hear again those lost voices and the stories they have to tell. More information about Pavilion here. 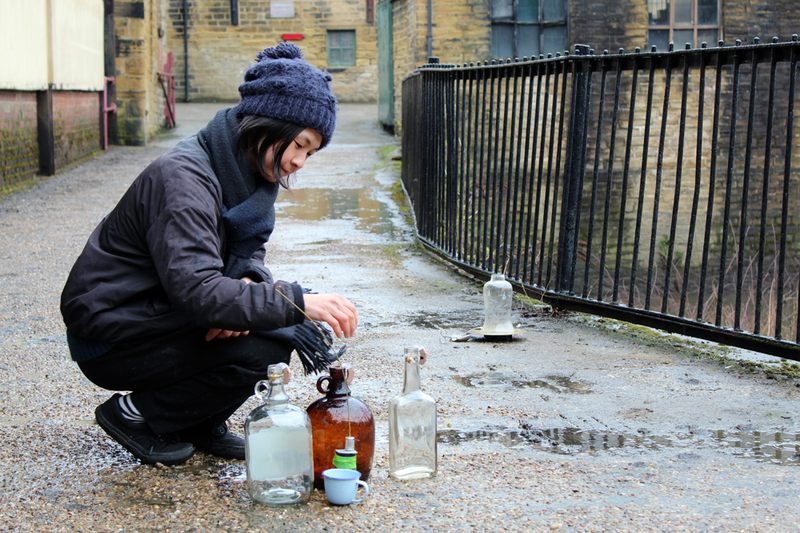 Interview with Ryoko Akama here on theCV.